A deadly, colorless, odorless, poisonous gas. It is produced by the incomplete burning of various fuels including: coal, wood, charcoal, oil, kerosene, propane, and natural gas. Products and equipment powered by internal combustion engines such as portable generators, cars, lawn mowers, and power washers also produce CO.
Internal combustion gasoline engines produce extremely high carbon monoxide concentrations. Even a properly tuned gasoline engine, will produce more than 30,000 parts per million (ppm) of CO in the exhaust stream before the catalytic converter. An exhaust leak can allow escape of CO before it is converted to non-toxic CO2 in the catalytic converter. 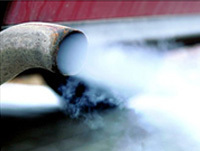 The CO leaking from the exhaust system can enter the vehicle through holes in the body or open windows or doors. Exhaust systems must be gas tight from the engine to the end of the tailpipe. The product of Catalytic Oxidation. The primary greenhouse gas emitted through human activities. In 2011, CO2 accounted for about 84% of all U.S. greenhouse gas emissions from human activities. Carbon dioxide is naturally present in the atmosphere as part of the Earth's carbon cycle (the natural circulation of carbon among the atmosphere, oceans, soil, plants, and animals). Human activities are altering the carbon cycle-both by adding more CO2 to the atmosphere and by influencing the ability of natural sinks, like forests, to remove CO2 from the atmosphere. While CO2 emissions come from a variety of natural sources, human-related emissions are responsible for the increase that has occurred in the atmosphere since the industrial revolution. Carbon dioxide (CO2) emissions in the United States increased by about 10% between 1990 and 2011. Since the combustion of fossil fuel is the largest source of greenhouse gas emissions in the United States, changes in emissions from fossil fuel combustion have historically been the dominant factor affecting total U.S. emission trends. Changes in CO2 emissions from fossil fuel combustion are influenced by many long-term and short-term factors, including population growth, economic growth, changing energy prices, new technologies, changing behavior, and seasonal temperatures. Between 1990 and 2011, the increase in CO2 emissions corresponded with increased energy use by an expanding economy and population, and an overall growth in emissions from electricity generation. Transportation emissions also contributed to the 10% increase, largely due to an increase in miles traveled by motor vehicles. 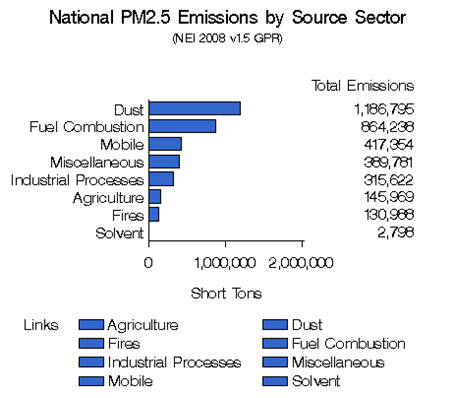 Particulate Matter (PM) - also known as particle pollution or PM, is a complex mixture of extremely small particles and liquid droplets. Particle pollution is made up of a number of components, including acids (such as nitrates and sulfates), organic chemicals, metals, and soil or dust particles. "Inhalable coarse particles," such as those found near roadways and dusty industries, are larger than 2.5 micrometers and smaller than 10 micrometers in diameter." "Fine particles," such as those found in smoke and haze, are 2.5 micrometers in diameter and smaller. These particles can be directly emitted from sources such as forest fires, or they can form when gases emitted from power plants, industries and automobiles react in the air. 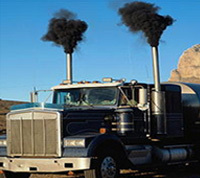 Diesel Particulate Matter is a component of diesel exhausts (DE) that includes soot particles made up primarily of carbon, ash, metallic abrasion particles, sulfates and silicates. Diesel soot particles have a solid core consisting of elemental carbon, with other substances attached to the surface, including organic carbon compounds known as aromatic hydrocarbons. In 2011, nitrous oxide (N2O) accounted for about 5% of all U.S. greenhouse gas emissions from human activities. Nitrous oxide is naturally present in the atmosphere as part of the Earth's nitrogen cycle, and has a variety of natural sources. However, human activities such as agriculture, fossil fuel combustion, wastewater management, and industrial processes are increasing the amount of N2O in the atmosphere. Nitrous oxide molecules stay in the atmosphere for an average of 120 years before being removed by a sink or destroyed through chemical reactions. The impact of 1 pound of N2O on warming the atmosphere is over 300 times that of 1 pound of carbon dioxide. Globally, about 40% of total N2O emissions come from human activities. Nitrous oxide is emitted from agriculture, transportation, and industry activities, described below. Agriculture. Nitrous oxide is emitted when people add nitrogen to the soil through the use of synthetic fertilizers. Agricultural soil management is the largest source of N2O emissions in the United States, accounting for about 69% of total U.S. N2O emissions in 2011. Nitrous oxide is also emitted during the breakdown of nitrogen in livestock manure and urine, which contributed to 5% of N2O emissions in 2011. Transportation. Nitrous oxide is emitted when transportation fuels are burned. Motor vehicles, including passenger cars and trucks, are the primary source of N2O emissions from transportation. The amount of N2O emitted from transportation depends on the type of fuel and vehicle technology, maintenance, and operating practices. Industry. Nitrous oxide is generated as a byproduct during the production of nitric acid, which is used to make synthetic commercial fertilizer, and in the production of adipic acid, which is used to make fibers, like nylon, and other synthetic products. The accumulation, transport and processing of sewage results in the generation of off gases that must be controlled and treated. These organic gases vary in make-up and concentration. Within a large metropolitan wastewater treatment (sewer) system, the chemistry and concentration of these undesirable gases will also vary within the hours of a given day. The community and surrounding areas must be protected from the toxic gases and offensive odors that are generated. The packed tower is possibly the world's most popular solution to this problem. Packed towers are also used to scrub acid gases and react with other undesirable emissions that come from a variety of industries. The processes that these structured scrubbers go through in order to remove contaminants from the contaminated gas stream is as follows: The gas stream passes through a packed structure with a large wetted surface area. The wetted area enables close contact between the gas and the scrubbing liquor, or scrubbing chemicals, which in turn allows the scrubbing liquor to react with the pollutants in the gas stream, removing them. Volatile organic compounds (VOCs) are emitted as gases from certain solids or liquids. VOCs include a variety of chemicals, some of which may have short- and long-term adverse health effects. Concentrations of many VOCs are consistently higher indoors (up to ten times higher) than outdoors. VOCs are emitted by a wide array of products numbering in the thousands. Examples include: paints and lacquers, paint strippers, cleaning supplies, pesticides, building materials and furnishings, office equipment such as copiers and printers, correction fluids and carbonless copy paper, graphics and craft materials including glues and adhesives, permanent markers, and photographic solutions.